2 miles to Disney property, the absolute closest residential development - 5 bedroom, 5 bathroom, 5 master suite home with game room, 6 LCD TVs, desktop computer, Playstation 4, Private Pool and Spa! Beautiful furniture and decor! Private gated resort with the guaranteed quickest access to the Disney parks! Pool can be heated for an additional 25USD + TAX per day. All linens and towels are provided. This home includes a fully equipped kitchen with all appliances and utensils. There is a full size washer and dryer, central air & heat, hair blowers, iron and ironing board, telephone service, patio table and chairs. 40 in. LCD/TV all other bedrom. High Speed Internet access (100+ Mbps), and great fast Wifi in the enitre home + pool area. Over the years this has proven to be a very popular vacation home. Close to 100 5 star reviews, And more is added all the time. We always do our best to make sure the home is kept in excellent condition, and do updates every year. The Windsor Hills resort is an absolutely amazing place to stay. It's nice and quiet. Close to all the major attractions in the area. Like Disney World, Sea World & Universal parks, loads of restaurants and so on. We just love this place. This home is located in Windsor Hills Resort. The Garage has been made into a Game Room so you can not park inside. Fitness room available at the club house. Windsor Hills has a tennis court you can use. There is an additional fee for pool heat! Staying at Windsor Hills as a location ranks in the top 4, the addition of the new waterslides should have made the main pool area greater instead the constant closing of the waterslides and the over use of whistle blowing turned that experience sour. I understand being safe but poor organization and inconsiderate pool staff created a poor atmosphere among guests, If Windsor Hills management would like me to elaborate please contact me. This review is to talk about our home on Teascone Blvd. we enjoyed the property and it was very usable and up to date. When a problem was reported the Global Vacation Home was understanding and dependable, like all property management companies they sublet items like pool and laundry. Upon arrival we seen there was a check list for linen that was not accurate (there was more linen than listed) but the list had no agent name or number as noted by the Global attendant that came by after our call, the linen had staining and discolored cloths that she quickly exchanged, she also brought a replacement toaster as only one side ours operated, she scheduled a fridge repairman and a pool company to come asap, later that day a Global serviceman came by to get items like broken drains, faucets, TV's and accessories up and running all in a fast and orderly manner, the Global people were understanding and attenuative, the fridge had a broken waterline that was fixed the next day, these items as Global said should have been noticed by the Global inspection prior to our arrival but because the check in list had no name or ID on it that will never be known. By now you might think we did not enjoy the home that is not the case it was very usable for our family. If vacationers reported items that would help future vacationers, There was a problem with the swimming pool that was determined to have happened due to the former pool attendant quitting and failing to keep that pool up it was heavy green with algae and had not had proper chlorine treatments since the last visitor (it looked bad) Global sent a pool person asap, the first person actually argued that the green was concrete staining but when we proved how heavy the algae was and how easily a scrubbing would remove it that person left and a supervisor with a helper came back and cleaned the pool & super shocked it and asked us not to swim in it for 24 hours and another pool maintenance person followed up-problem solved. Good Stay and we would come back. We recently got back from our trip to Windsor Hills. The house was great, clean and the location was perfect. We stayed with two families (4 adults and 5 kids under the age of 6) and it met all of our needs. We were a little concerned that there was not an extra fence for the pool but with the alarm system this was never an issue. The beds were very comfortable, there is a pack n play and a highchair. Lots of towels for both showering and the pool. The only thing we missed having was a cheese grater lol which didn't impact our stay what so ever! We would absolutely stay in this home again. We have stayed at the Windsor hills resort the past few years and this has been our favourite house thus far. From the decor, the location and the attention from the owner you can't go wrong booking in here. Lovely home, clean, well kept, great location! We enjoyed our stay in this lovely home in the Windsor Hills neighborhood. We chose this home because it had 3 king bedrooms, provided a pack & play and high chair, and the pool was heated. We had ample room for our family of 10. The reason I did not rate the property 5 stars is that we reported that the refrigerator water spout on the door did not work and when pressed, water leaked out of the bottom of the refrigerator. The management company said they would send someone out to fix it but was still broken 6 days later. Also, the kitchen is completely empty of any consumable items with the exception of one roll of paper towel, a sponge, and one packet of dishwasher detergent. Think of it more like a hotel room. It would have been helpful to have salt/pepper, a coffee filter, a few spices and a bit of cooking oil. If I had known this ahead of time I would have included these items on our list since we shopped prior to checking in and had to go out again for those items. 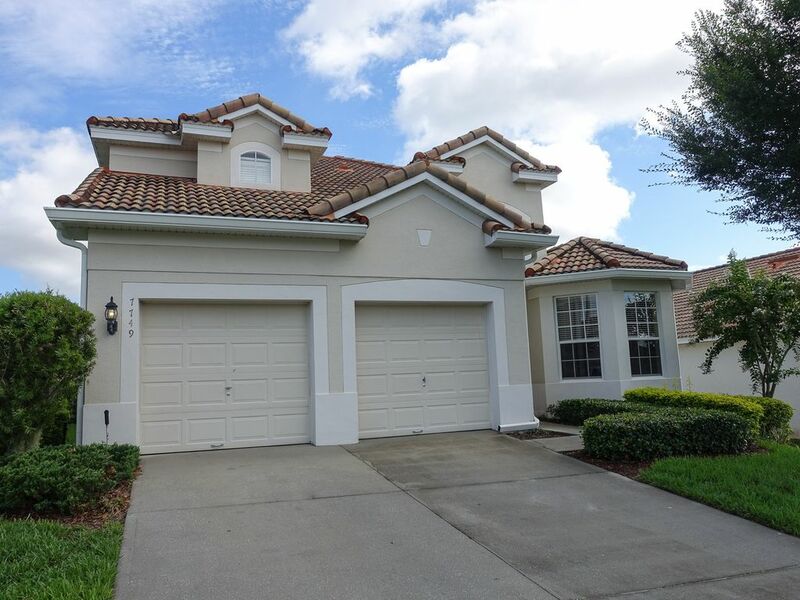 The neighborhood is very close to all of the Disney attractions, shopping and restaurants. We made use of the community pool and the kids loved the water slides. I would definitely recommend this home! Great house. Size was perfect, fit all 10 of us with no problem. The house was spacious, very nice and clean. No complaints about the house, itself. We didn't spend a lot of time there, spending our time at Disney. I wasn't aware of a two car rule. We had three cars, which would fit in the driveway but had to leave one in a parking lot. One reason I rented this house was the large driveway. Also, there was a shortage of toilet paper, paper towels, dish detergent and dishwasher detergent. We did not bring those items and think it would be helpful to leave, at least, a starter amount, so people don't have to immediately go shopping. Overall, our stay was very good and close proximity to Disney, which was the reason we were there. I would recommend this house to anyone looking to sleep up to 12 and want something close to Disney.